Those interested in Irish history and heritage should look no further than the National Library of Ireland. The library is home to important archives that can help trace family lineage or offer a peek into the past of the country as a whole. Located on Kildare Street in Dublin, the library is open to visitors and researchers who can make use of the impressive stacks of documents and settle into the reading room for free. The National Library of Ireland was established in 1877 to make the collections of the Royal Dublin Society available to the public. 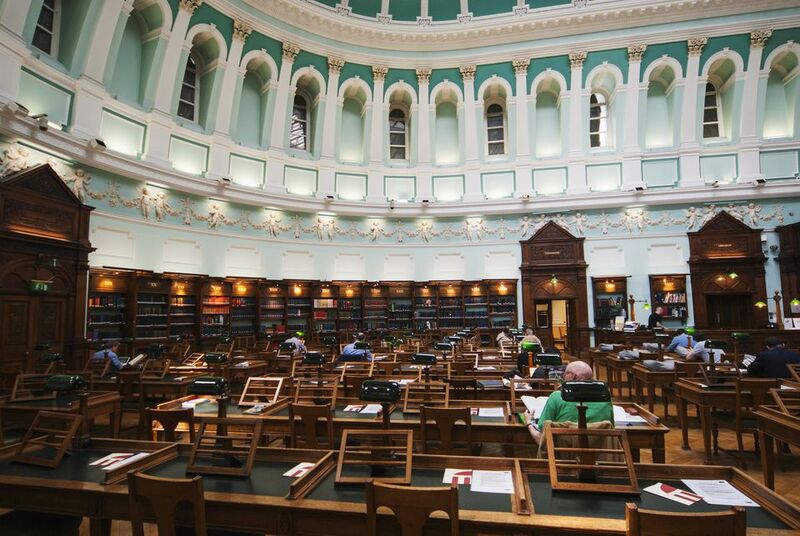 The reading room opened a few years later, in 1890, and it has been Ireland’s main reference library ever since. Over the years, the library has been managed by various ministries but it became an independent institution in 2005. It is located on Kildare Street in Dublin, close to many of the main government offices. The mission of the library is to collect and preserve the documentary and intellectual record of the life of Ireland. The two founding collections came from the Royal Dublin Society, as well as the personal collection of Dr. Jaspar Robert Joly, who stated that "if … a public library should be established in Dublin under the authority of Parliament … analogous to the library of the British Museum in London … it shall be lawful for the said Society to transfer the collection to the trustees of such public library." The Joly Collection was made up of nearly 25,000 items relating to Irish history and offered a rich beginning for the new archival library. Today, the National Library of Ireland has around 8 million items – ranging from books, newspapers, and periodicals, to personal letters and genealogy records. Nearly 200,000 people came in 2018 to visit the exhibits, research family history and explore the stacks of books. The National Library of Ireland regularly hosts exhibitions at the library on Kildare Street as well as photo exhibits at the National Photography Archive in Temple Bar. Exhibitions change regularly but you can find the current and future schedule here. Almost all exhibits are related to Irish history or literary figures. For example, recent shows focused on the life and work of William Butler Yeats, as well as a show of posters from the national archives to illustrate the experience of Ireland during World War I. Like the rest of the library, exhibits at the National Library of Ireland are free to visit during regular opening hours. If you cannot yet visit in person, some of the exhibits are also available online. You can browse digital copies of historic documents related to the 1916 rising or explore five mini-exhibits on other key moments in Irish history that have been shared on Google’s Cultural Institute. One of the most valuable resources at the National Library of Ireland is the free Genealogy Advisory Services. It is best to come with as much information as possible by first talking to your family members and gathering any records that might indicate more about your Irish history. However, even if you are just beginning the search, the service can help you find out where to start. No appointments are needed to speak with an employee, and the service also offers free onsite access to a number of genealogy websites that normally require a paid subscription. If you are unable to go to the National Library in person, you can also get in touch via email genealogy@nli.ie or telephone +353 1 6030 256. Tuesday and Wednesday: 9:30 a.m. - 7:45 p.m.
Thursday and Friday: 9:30 a.m. - 4:45 p.m.
Saturday: 9:30 a.m. - 12:45 p.m.
Genealogy Advisory Services are available at the National Library of Ireland on Monday through Wednesday from 9:30 a.m. until 5:00 p.m., as well as on Thursday and Friday from 9:30 a.m. to 4:45 p.m. Visitors should be aware that the library began a four-year phased renovation in 2017, so please consult the website to stay up to date of any changes or closures. For the most part, business should continue as usual. The National Library of Ireland is located between Merrion Square (where you will find a famous statue of Oscar Wilde) and St. Stephen’s Green. Both parks are lovely places to stroll to get some fresh air after digging through the archives. The library is also close to the Natural History Museum and the National Gallery if you are looking for other interesting exhibits. Shoppers can leave the library and find upscale stores of all types a short walk away on Grafton Street.